1LDMLGP LLC: Here is a link to the mixtape that you are featured on from your submission to Coast 2 Coast Mixtapes. Congratulations on your mixtape spot! Check it out at: Coast 2 Coast Mixtapes Presents: #WeWorkin Mixtape Vol. 263 Please help promote the mixtape by going to Coast 2 Coast Mixtapes Presents: #WeWorkin Mixtape Vol. 263 and click the Facebook Share button on the page to share to your Facebook friends, then click the Tweet button on the page to simply share the mixtape to your Twitter followers. Here is a link to the mixtape that you are featured on from your submission to Coast 2 Coast Mixtapes. Congratulations on your mixtape spot! 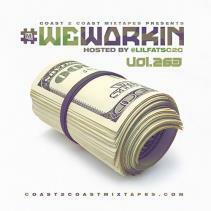 Check it out at: Coast 2 Coast Mixtapes Presents: #WeWorkin Mixtape Vol. 263 Please help promote the mixtape by going to Coast 2 Coast Mixtapes Presents: #WeWorkin Mixtape Vol. 263 and click the Facebook Share button on the page to share to your Facebook friends, then click the Tweet button on the page to simply share the mixtape to your Twitter followers. Please help promote the mixtape by going to Coast 2 Coast Mixtapes Presents: #WeWorkin Mixtape Vol. 263 and click the Facebook Share button on the page to share to your Facebook friends, then click the Tweet button on the page to simply share the mixtape to your Twitter followers.